David Lawrence Rare Coins - DLRC Auctions has been serving the numismatic community for over three decades. Since 1979, they have built long-term relationships with customers, specializing in certified U.S. coins graded by PCGS, NGC and CAC. Whether you are buying or selling, auctioning or consigning, gain an understanding into the value of your collection. An overall view of an auction illustrates that coins are appreciated for a number of reasons: rarity, beauty, denomination, metal content, date, mint of issue and more. Reviewing values realized at auction gives an insight into all of these factors. Picking one, let's look closer into scarcity. To complete a collection, collectors are always searching for that one scarce, rarely found date, creating quite a demand. Highlighting one popular series to collect by date and mint, Morgan silver dollars, contain a particular group of scarce coins, the mint marked examples from the Carson City "CC" mint. Specifically, have a look at current auction offerings within the silver dollar heading. A Carson City "CC" mint marked dollar is quickly noted as desirable in all ranges of preservation, from well circulated to untouched gems. Another auction observation is the demand for top condition silver dollars, these are also bid to high valuations. Scarce condition is another factor setting a coin apart. 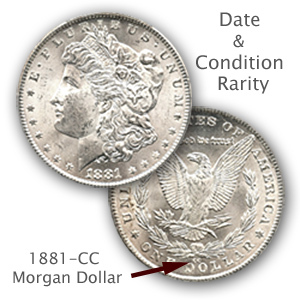 A Morgan dollar may be readily available in worn condition however in many instances the same date and mint in top "gem" condition is a rarity. Such a coin, as the one pictured, combines both rarity and top condition and always attracts serious collectors. Pick from your box of old coins a denomination and series, view offerings of these coins at auction, it's not long before an impression of value of your coins begins to take shape. Informed decisions are profitable. Your old coins are the core of the hobby of coin collecting, the study of coins - numismatics forms this strong connection. One area to review, under the headings Web Resources and Related Sites, David Lawrence Rare Coins hosts a large repository of online books, videos and articles. Here is an example of the information available, let's choose dimes. 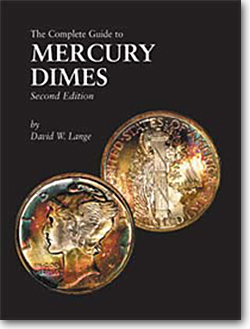 A very good read is "The Complete Guide to Mercury Dimes." From the history of the Mercury dime, to date and mint analysis, to grading and collecting, lots can be gleaned from this book. They are not just old dimes any longer, you quickly gain an in-depth understanding and the importance of your coins to both you and collectors. The "why" to the value of your coins is fascinating. 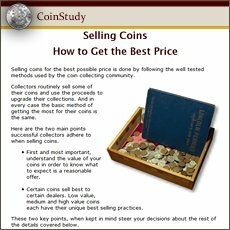 Review and study a rare coin auction to suit your needs.